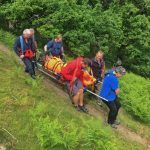 Incident Details: A couple rang the police to say they had passed a male struggling down the path above Wythburn Church, and thought he might have taken a fall. The Team sent out two vehicles to try and locate this person, which they did within a short time. In the event, he did not require assistance, but was simply struggling a bit descending. Reported with good intent, but a false alarm. 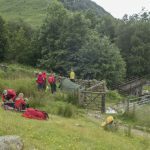 One of the Team vehicles lifted the man to his accommodation in Grasmere. 11 Team members – 1 hour 34 minutes.